Herbert Wright finds joy in the work of graphic designer and architect MacDonald Gill, on show at Suffolk’s Lettering Arts Centre. Leslie MacDonald 'Max' Gill's letters in stone have the simplicity and authority of Roman inscriptions. Like the Latin characters, they aspire to eternity, and they are scattered even further, as far even as remote Pacific islands. This is the lettering on the 1.1 million headstones which mark fallen British and Commonwealth forces from both world wars. And yet, despite his trace in the solemn sorrow of each name and brief epitaph, there was an irrepressible cheeriness in Max, which surfaced socially and shows in his work as a graphic designer and cartographer. Much of it bursts boyishly with joy, invention, enthusiasm and mischief. And this is the mood colouring MacDonald Gill's retrospective at the Lettering Arts Centre in Suffolk, which brings his work out from the shadow of his elder brother, Eric Gill, the sculptor and creator of fonts such as Gill Sans. As the 20th century began, Max followed in Eric's footsteps. Both moved to London, trained with (different) ecclesiastical architects, took evening classes in calligraphy from Edward Johnston, and they collaborated and even lived together. Both were commissioned by Frank Pick, first head of London Transport -- Eric's sculptures later decorated the Charles Holden-designed HQ over St James's Park Station. MacDonald Gill was commissioned in 1914 to make a poster to brighten gloomy Tube platforms. 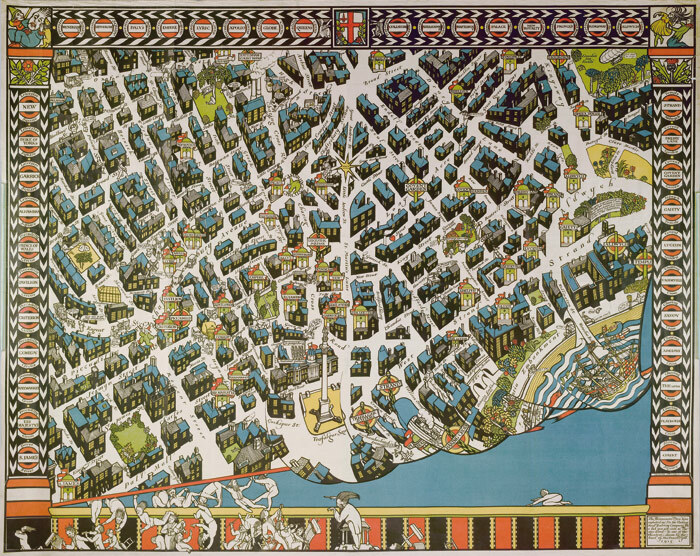 His pictorial map, the London Wonderground, was so entertaining it made people miss their trains. It wasn't the streets or buildings that fascinated people most, but the random characters embedded in it, not unlike Martin Handford's more recent Where's Wally? books. MacDonald Gill's figures usually say something more ridiculous than funny. A policeman grasps a fleeing nobleman's cloak and exclaims, 'The Earl's caught!'... you can guess at which station. The sister poster, Theatreland (1915), floats a Zeppelin over Lincoln's Inn Fields, and a figure called Eric warms his hands on the fire of what an annotation says is 'a real bomb'. Meanwhile, an orchestra frolics along the map's lower margin. The contrast between this and MacDonald Gill's work for the Imperial War Graves Commission could not be greater. The unremitting horror of the First World War was unfolding, and where resting places of servicemen could be marked, mere temporary wooden crosses were being planted. The 1917 brief was simple: headstone inscriptions must be clearly legible from an angle of 45 degrees, from six feet (2m) away. Moreover, the commanding officer and the squaddie were equal in death -- the lettering, in upper case only, was the final leveller. Interestingly, the clean, restrained alphabet MacDonald Gill designed (a template drawing of which is on show) is not dissimilar to Victor Lardent's Times New Roman, which was not designed until 1931. In a war where killing was mechanised and on a scale never before seen, these letters were designed to be machine-cut in vast numbers, rather than individually by a mason. This infuriated brother Eric, who in 1919 raged against 'the evils resulting from modern industrial methods' at the expense of the local mason's yard, and a 'uniform mediocrity' of standardising everything that incorporated the 'feebly artistic' lettering. He was still fighting the culture wars of earlier times, an Arts and Crafts position against mass production. Perhaps fraternal jealousy was also at play. In any case, it would have taken decades for masons to craft the sheer quantity of headstones. MacDonald Gill was also an architect, but this show is not about that. His work includes Arts-and- Crafts-styled houses, but only a noticeboard design for St Clement Danes, London, makes it here. But he long kept the company of architects. His first professional map was for a Lutyens house at Nashdom Abbey in 1909. The exhibition features several later maps, huge colourful works such as Ceylon (1933), illustrated with animals and ships at sea, echoing maps from the age of discovery, or the Tea Revives the World map (1940), full of figures and explanations about national tea habits, plus more ships. For the Post Office, he made world maps that marked the British Empire and showed sea-mail routes (with yet more ships, dated consecutively from 900 to 1936 and individually framed) and radio-telephone connections. Technology fascinated him, and the latter map includes drawings of electrical-equipment installations. The GPO logo he designed in 1934 is one of many identity commissions on show, this one striking for its circle-based modernistic flat simplicity. Despite his meticulous attention to detail and, where he had the chance, his orgies of humourous embellishment, MacDonald Gill knew how to strip things down to what mattered. 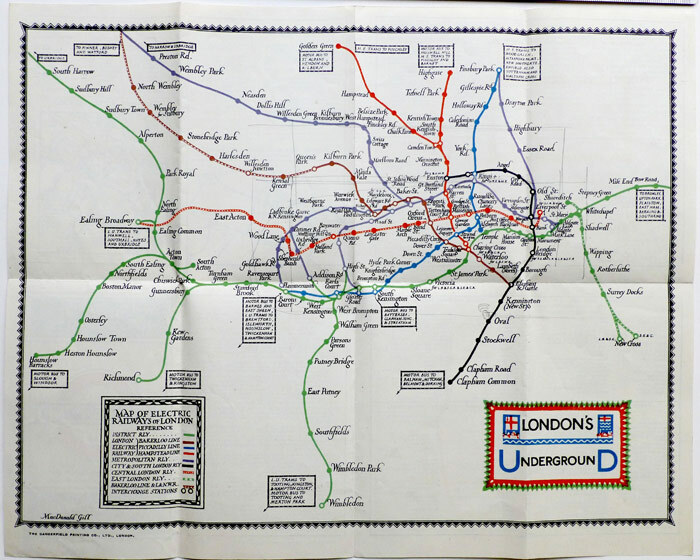 His war-grave lettering was one example; another was the Tube map he designed in 1920, a folding 1922 version of which is another exhibition highlight. This was the clearest tube map to date, every station named prominently in flowing script, and the road network and river dispensed with entirely. When Harry Beck famously dumped geography by making the map a diagram in 1933, even he would not omit the Thames. MacDonald Gill's last work was another global poster for Cable and Wireless in 1946, a half-coloured draft of which is included in the show. He died the next year. Next to Eric Gill's mystical sculptures and sensuous drawings, his brother's work may seem light stuff, but that would be to dismiss the exquisite skill and vivid imagination in them. 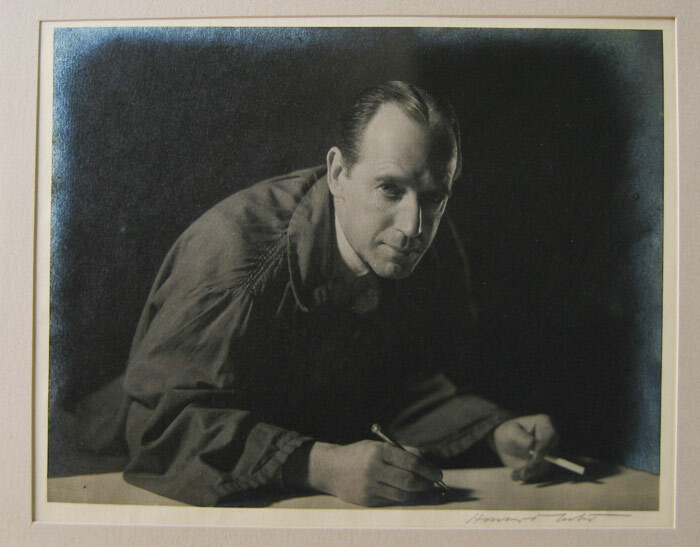 MacDonald Gill was a master of his time, bridging the worlds of crafts and technology, and he opened new avenues of clarity in design. It's certainly worth the trip to Suffolk for the revelation of this show.